Every month, the moon swings full circle in front of the constellations of the Zodiac. 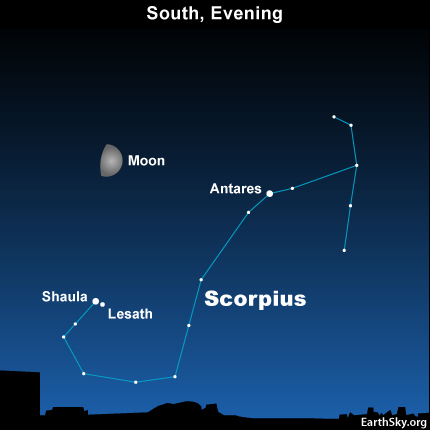 And each month, as the moon parades past the constellation Scorpius, the moon makes sure to stay a safe distance above the Scorpion’s stinger stars, Shaula and Lesath. After all, the lore of the skies tells us the Scorpion’s stinger put Orion the Mighty Hunter to death. As seen from mid-northern latitudes in North America, the stinger stars loom close to the southern horizon at early evening, a good fist-width below tonight’s waxing gibbous moon. Depending on where you live worldwide, the moon’s position relative to the Scorpion’s stinger stars varies somewhat this evening. If you live in Europe or Africa, the moon appears about one-forth the way closer to Antares, Scorpius’ brightest star. Asian viewers see the moon about halfway between the chart moon and Antares. For those residing in the southern hemisphere, you will see the moon and the stinger stars high overhead, not close to the horizon. When the moon drops out of the evening sky in late August and the first week in September, you can use the stinger stars to star-hop to two beautiful deep-sky treasures: the star clusters M6 and M7. Site contents copyright © 2019 Recorder Online	except as noted. All rights reserved. | 88 queries in 2.187 seconds.